Money Bags is one of the best games for teaching your kids about money. 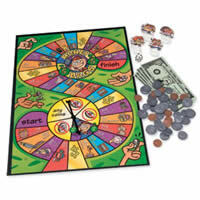 Your goal in this fun and unique teaching game is to earn money by following what the board says. Ways to earn money might include chores or selling cookies. Critical thinking and counting are important parts of this game. Hope that luck is on your side because you could earn some extra money. Check out Money Bags for a great game for learning about money and a fun time with the entire family. To win the game of Money Bags you must be the player with the most money at the end of the game. Money Bags board game should come with game board, die, 100 plastic playing coins (25 of each: quarters, dimes, nickels, and pennies), 10 play 1-dollar bills, 4 playing pieces, and the Money Bags rules and instructions. Please keep in mind that the official Money Bags board game rules and instructions could be different depending on the game version you have. The rules below are some of the exact directions on how to play Money Bags. Share with us your comments, funny stories, tips, advice, strategies, creative ways to play, questions about how to play, problems with the rules or anything you want about Money Bags. All submissions will be reviewed within 24 hours. Click here to add your Money Bags comments. I've never heard of this game but sounds very interesting as a way to teach about money to kids. My sister had a preschool, I wonder if the kids would like something like this. Better hold on to the game rules because that is the first to get destroyed.